This was quite strange since I knew for sure that my monitor display mode was NOT set to 256 colors, but rather 32 bit. Just to make sure, I double checked my color settings, made sure I wasn't running the application in 256 color compatibility mode... But I still had the problem. Exasperated as I was, I looked up the Rise of Nations troubleshooter (http://support.microsoft.com/kb/820089) and decided to update my drivers. Turns out they were outdated, but this didn't solve the problem. Finally, after a few hours of research (literally), I came across a forum thread in which a certain user said that the problem was that Rise of Nations requires a minimum screen resolution of 1024x768 to run, whilst my netbook had a maximum of 1024*600. I find it formidably misleading that RON complains about the colors, while the actual problem is with the resolution but... well... that's life. Fortunately, even though your netbook may not have a screen big enough for Rise of Nations, there is a program (found here) that actually emulates a larger screen! So download and extract it. The program comes in a *.rar file, so you'll need 7zip, Universal Extractor, or equivalent software. Right click the icon. A menu will appear. 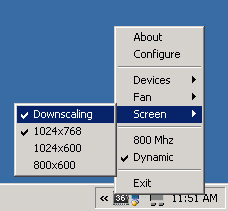 In this menu, go to screen, the select the 1024x768 resolution, and select Downscaling (not necessary, but I strongly recommend it). That's it, now you should be able to play Rise of Nations! I hope you've appreciated this article.